Look up crucible in Wiktionary, the free dictionary. The use of crucibles in the Iron Age remains very similar to that of the Bronze Age with copper and tin smelting being used to produce bronze. The Iron Age crucible designs remain the same as the Bronze Age. During the Roman period a new process of metalworking started, cementation, used in the production of brass. This process involves the combination of a metal and a gas to produce an alloy (Zwicker et al. 1985: p107). Brass is made by mixing solid copper metal with zinc oxide or carbonate which comes in the form of calamine or smithsonite (Rehren 2003: p209). This is heated to about 900 °C, the zinc oxide vaporises into a gas, and the zinc gas bonds with the molten copper (Rehren 1999: p1085). 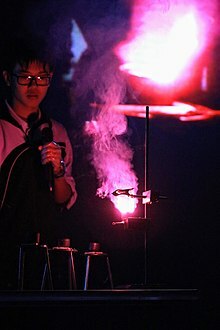 This reaction has to take place in a part-closed or closed container otherwise the zinc vapour would escape before it can react with the copper. Cementation crucibles therefore have a lid or cap which limits the amount of gas loss from the crucible. The crucible design is similar to the smelting and melting crucibles of the period utilizing the same material as the smelting and melting crucibles. The conical shape and small mouth allowed the lid to be added. These small crucibles are seen in Colonia Ulpia Trajana (modern-day Xanten), Germany, where the crucibles are around 4 cm in size, however these are small examples. 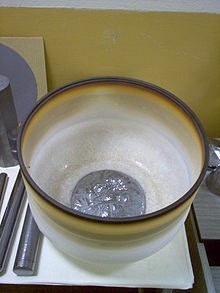 There are examples of larger vessels such as cooking pots and amphorae being used for cementation to process larger amounts of brass; since the reaction takes place at low temperatures lower fired ceramics could be used. The ceramic vessels which are used are important as the vessel must be able to lose gas through the walls otherwise the pressure would break the vessel. Cementation vessels are mass-produced due to crucibles having to be broken open to remove the brass once the reaction has finished as in most cases the lid would have baked hard to the vessel or the brass might have adhered to the vessel walls. The cementation process, which was lost from the end of the Roman to the early Medieval period, continued in the same way with brass. Brass production increased during the medieval period due to a better understanding of the technology behind it. Furthermore, the process for carrying out cementation for brass did not change greatly until the 19th century. However, during this period a vast and highly important technological innovation happened using the cementation process, the production of crucible steel. Steel production using iron and carbon works similarly to brass, with the iron metal being mixed with carbon to produce steel. The first examples of cementation steel is wootz steel from India (Craddock 1995: p276), where the crucibles were filled with the good quality low-carbon wrought iron and carbon in the form of organics such as leaves, wood etc. However, no charcoal was used within the crucible. These early crucibles would only produce a small amount of steel as they would have to be broken once the process has finished. By the late Medieval period steel production had moved from India to modern-day Uzbekistan where new materials were being used in the production of steel crucibles, for example Mullite crucibles were introduced. These were sandy clay crucibles which had been formed around a fabric tube. These crucibles are used in the same way as other cementation vessels but with a hole in the top of the vessel to allow pressure to escape. At the end of the Medieval and into the Post Medieval new types of crucible designs and processes started. Smelting and melting crucibles types started to become more limited in designs which are produced by a few specialists. The main types used during the Post Medieval period are the Hessian Crucibles which were made in the Hesse region in Germany. These are triangular vessels made on a wheel or within a mould using high alumina clay and tempered with pure quartz sand. Furthermore, another specialised crucible which was made at the same time was that of a graphite crucible from southern Germany. These had a very similar design to that of the triangular crucibles from Hesse but they also occur in conical forms. These crucibles were traded all across Europe and the New World. Crucible are used in the laboratory to contain chemical compounds when heated to extremely high temperatures. Crucibles are available in several sizes and typically come with a correspondingly-sized lid. A crucible with a bottom perforated with small holes which is designed specifically for use in filtration, especially for gravimetric analysis as just described, is called a Gooch crucible after its inventor, Frank Austin Gooch.